Lovis Corinth holds a position in German art history similar to that occupied by Edouard Manet in the history of French painting. Bridging the 19th and 20th centuries, Corinth had his feet in two worlds. He began as a fairly conventional (and highly successful) academic painter, but lived to participate in the birth of Expressionism. In his bold use of impasto and, most of all, his intensely personal approach to his subjects, Corinth is one of the most important precursors and pioneers of German modernism. Although he is revered in his native Germany, Corinth is less well known internationally, in part due to a paucity of major oil paintings on the international market. This lack, however, is amply compensated for by the availability of the artist's compelling works on paper. The Galerie St. Etienne first exhibited Corinth's work in the United States in 1943. At the time, the gallery had a close relationship with the artist's widow, and that relationship later continued with his son and daughter. In addition to organizing repeated exhibitions of Corinth on its own premises, the Galerie St. Etienne has endeavored to constantly make him better known in the US by encouraging scholarship and museum exhibitions. Lovis Corinth was an unlikely artist. His birth, in 1858 in the East Prussian town of Tapiau, was inauspicious at best. Culture and refinement were unknown concepts in his family, which was dominated by his loutish and at times violent stepbrothers. (The artist's mother, thirteen years older than his father, had brought five adolescent sons to the marriage.) An indifferent student, Corinth first knew happiness when, in 1876, he convinced his father to let him leave highschool for the Königsberg Art Academy. Here he began some eleven years of artistic training, tracing a checkered path from Königsberg to Munich to Antwerp to Paris and back again, finally, to Munich and Königsberg. At the Académie Julian in Paris, facing nationalistic hostility from his French competitors, Corinth was granted admission to the prestigious Salon, but denied the "honorable mention" he so dearly coveted. Over the ensuing years, he gathered a small share of favorable reviews and awards (even, in 1890, an "honorable mention" in Paris), but he lived off the income from his family's property. Only in 1895, at the age of thirty-eight, did he sell his first painting. Corinth, like many artists of his time, eventually came to earn a good living from his portraits, and his oeuvre included a broad range of subjects, from landscapes, nudes and still lifes to genre pieces. However, his schooling and subsequent professional experiences taught him to expect the most accolades for elaborate figural compositions depicting traditional religious, historical and literary themes. It was with such works that he gradually garnered his reputation, first in Munich and then in Berlin, where he moved in 1901 to seek his fortune with the recently founded Secession. Firmly rooted in the academic naturalism that constituted the core of Corinth's lengthy training, his paintings had a sensuality and a contemporary immediacy that some critics found disrespectful to the loftiness of their ostensible themes. 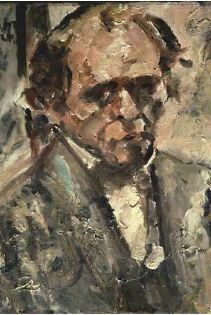 Corinth's increasingly vigorous impasto -- influenced by French Impressionism -- equally placed him within the ranks of the current avant-garde, to the occasional disgruntlement of more conservative forces.